Nine years after the debut of its entry-level IS sports sedan, Lexus is taking the door count down by two and chopping off the roof. Simultaneously. Unlike most car companies, who build dedicated sedan and coupe models and produce a drop-top version a few years later, Lexus has decided to do both at the same time. A trick folding hardtop roof has allowed the IS C to be two cars in one, though unfortunately it doesn’t fulfill both roles as competently as some of its more focused competitors. Sure, the car drives as well as the IS 250 and 350 sedans currently on offer – and that’s no easy feat – but aesthetically it’s a bit bulky and misshapen in the same way a puppy has awkwardly oversized legs and feet. 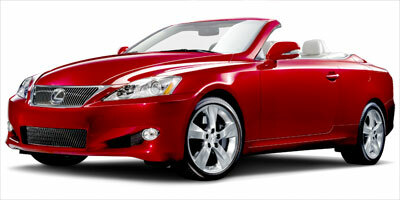 Part of the reason for this is Lexus’ insistence the IS C utilize a folding hardtop, the other the decision to leave some usable trunk space for when the top is down (unlike the Infiniti G37 Convertible, which has enough space for an extra pair of socks and a stick of gum). Lexus has made up some ground on the competition when it comes to pricing, however, firmly placing the IS 250C below the oh-so-vital $40k mark. Plus, your friend probably won’t look so cool when his golf clubs are hanging out of the G37’s backseat, will he? Despite the added weight of a folding hard top, motors and bracing, the IS C has managed to retain its driving composure – top up or down. A properly spacious trunk when the top is up that leaves room for more than a bottle of water when the roof is down definitely adds to buyer appeal as well. Revisions to the navigation menus bring some much-needed order to the user interface. With the top down, wind has a tendency to buffet forward from the rear seats. This isn’t a problem on a warm day, but even in mildly cold weather it can feel too drafty. There is some backseat space, but any potential passengers will be treated to a wind bashing so brutal they’re likely to get out and walk. Despite the loss of its structurally integral roof, the IS C manages to maintain all of the comfort and drivability of the standard IS sedan. This has been achieved through heavy use of reinforcement bracing, which, along with the 15 motors added to raise and lower the folding hard top, has conspired to add between 350 and 400 lbs to the convertible’s curb weight. The result is a ballooned-up car that never feels truly fast, even with the optional 306 horsepower V-6 engine. It is, however, a generally comfortable, quiet place to be. In other words, it’s exactly like the IS sedan. If using a clutch to swap the gears yourself sounds appealing, the 2.5-liter engine is your only choice. You’ll really have to rev the engine to get it going, but the gearshift is notchy, positive and far more sporting than the somewhat unpredictable automatic transmission. The automatic roof can be lowered in a brief 20 seconds – quick enough to grant it class-leading accolades – but make sure you have the time to get it all the way down as the roof will cease deployment above three mph. Two V-6 engines are available in the Lexus IS C. The IS 250C is powered by a 2.5-liter engine that makes 204 horsepower and 185 lb-ft of torque. Power is driven to the rear wheels via either a six-speed manual or optional six-speed automatic gearbox. 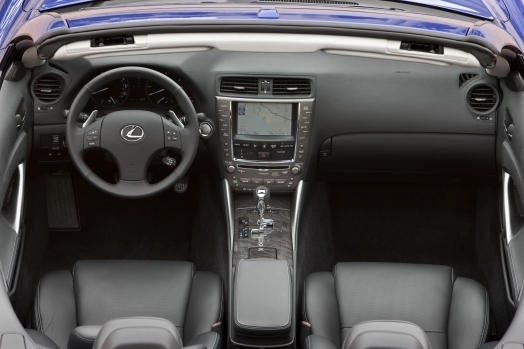 The IS 350C is powered by a 3.5-liter four-cam V-6 engine, good for 306 horsepower and 277 lb-ft of torque. The only available transmission is a six-speed automatic with paddle shifters. Prefer your IS C with a shot of adrenaline? Lexus recently introduced its F-Sport performance parts to the IS range. Up for grabs are add-ons such as high performance brakes, sport-tuned springs, shocks and sway bars, wide 19-inch wheels offering tons of grip, a cold air intake, bombastic free-flowing exhaust and a shift kit for manual cars. We would also recommend picking up the windscreen to eliminate irritating cabin wind. It covers the rear seats, rendering them useless, but will keep you from freezing on colder days. Lexus has revised the IS navigation system for 2010, and we’re happy to say it delivers a much better user experience over the model it replaces. Audio inputs are now selected via tabs at the top of the audio screen, and Bluetooth audio is finally offered as a wireless MP3 connectivity option. A 12-speaker Mark Levinson audio system has historically proven an excellent addition to the IS sedan, and it doesn’t disappoint in the convertible. At 21 mpg city and 29 mpg highway, the IS 250C automatic delivers the best fuel economy of the bunch and is exactly on par with its sedan equivalent. Manual transmission 2.5-liter cars have a shorter final drive ratio, resulting in 18 mpg city, 26 highway. The IS 350C is only slightly worse at 18 city, 25 highway. All IS C powertrains receive a coveted ULEV-II emissions rating. Much like the IS sedans, the interior of the IS C is comfortable, luxurious and decisively modern (aside from a centrally-mounted clock that appears to have been pulled from a 1992 Toyota Camry). The clear, clean electroluminescent gauges are impressively formed and the leather surfaces feel sculpted purely for comfort. Top down, the IS C looks pretty sporty, its bulbous haunches and long rear deck somewhat disguised. With the top up, however, it gets a lot worse – the long, flat trunk lid and high rear beltline are much more apparent. Just keep the top lowered whenever possible. 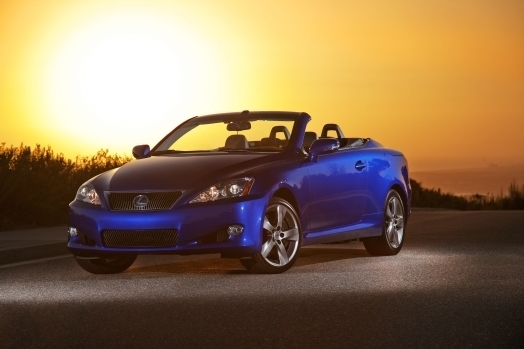 With an MSRP of $38,490 for the IS 250C manual and $39,660 for the automatic, Lexus has hit the perfect price point, offering the only luxury hard-top convertible on the market for under $40k. Competitors include the $44,550 BMW 328i Convertible, $56,100 Mercedes-Benz CLK Cabriolet, $40,750 Audi A4 Cabriolet and the Infiniti G37 Convertible, at $43,850. The IS 350C comes in at $43,940. 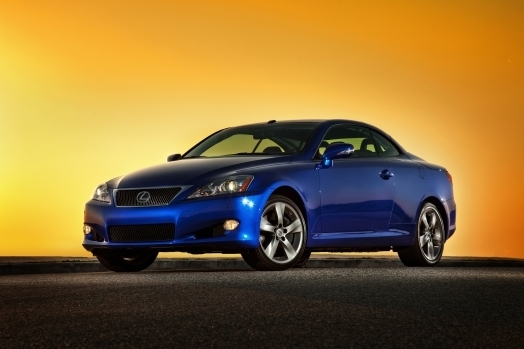 Looked at purely as a drop-top cruiser, the Lexus IS C is offers a lot of value compared to its more expensive competitors. Ok, so the extra weight has fuddled up the performance and the folding hardtop has given it a somewhat ungainly profile, but that’s all part of the convertible game. With the top up it’s a quiet, relaxing place to be, and – minus a little extra wind – with the top down it’s just as good. And at the end of the day, that’s what a Lexus should be.